On an almost daily basis, those commenting on true crime use the phrase that the criminal [any criminal in a high-profile case] “just snapped”. It’s a doozy. And in just two words the case is solved from bottom to top, left to right and everywhere in-between. There’s no need to have an investigation or a trial or write a single word in a book about the case because the case has been solved. He “just snapped”. The term is so permissive it was actually used as the title of a true crime documentary about Scott Peterson – SNAPPPED. One of the reasons the “just snapped” idea is so popular is because so many criminals in court, or in their versions of events like to use it, their families like to use it and dumb journalists unthinkingly recycle it. Many people, including the Judge hearing the case, and many trial pundits and media folk, believed this story and as a result Oscar initially beat the murder charge against him. Fortunately, saner minds prevailed and the culpable homicide charge was eventually overturned to murder. Jodi Arias also used the idea of herself drawing a blank when the crime happened. She wasn’t thinking when the murder happened, she went into a fog. And then, at a particular time when it was all over, the fog lifted. So something in Jodi, according to her, snapped too. So with so many buying into the “snapped” scenario in the mainstream media, it’s not surprising that social media regurgitates the same thing. But isn’t “just snapped” the lazy man’s way of addressing a simple but difficult question? When there are no low hanging easy answers to why, then “just snapped” answers why, except “just snapped” is about as useful as “just because”. It was while I was researching a book on mass murderers that this default non-explanation really came to the fore, and the more it did the more I made it my personal mission to figure it out and give it the proper true crime treatment. As such I consider SLAUGHTER one of my best achievements in true crime to date. What I discovered researching SLAUGHTER was that the more heinous the crime the more inexplicable it is. Apparently. So the more people someone kills, the less reason they have for killing – they’re monsters, and mad, end of story. And so the poster child for a confounding motive is Stephen Paddock. His crime is so sadistic that no one – not the FBI, not the cops, not his family – no one was able to figure out why he did what he did. Even today that remains the case! Apparently he had no motive. And because we can’t figure out his motive, maybe he didn’t have one…And because he didn’t write a suicide note explaining his actions, apparently what we’re left with is an unsolvable riddle. Ergo “He snapped”. Initially, Paddock was a tough nut to crack. But as I did more and more research on 7 other mass shooters, I was surprised by how clear the motive and the sadistic patterns were in each case. Just as serial killers can be profiled, so can mass shooters and school shooters. The dirty little secret about school shootings is it’s very easy to see who the most likely candidate is going to be, but counter-intuitively, knowing that can actually precipitate the shooting. How is that for a mind bender to the “just snapped” theory, that specifically in the high school setting one can actually set off a crime ahead of time by profiling your most likely shooter. An incredible case study to understand why the “just snapped” notion is such ridiculous heresy is Adam Lanza. Thanks to the FBI there is a treasure trove of data which I dug into in detail in SLAUGHTER which reveals how chronically dysfunctional Lanza was as a person. Since we’re dealing with Chris Watts here, I won’t go into detail to say how and why we know Lanza didn’t just snap, just that he’s a classic case where neighbors and the public assumed that’s what happened, while a careful study of who he was, his habits, the dynamics with his mother and his digital breadcrumbs clearly showed months of meticulous planning. And that’s really the essence of it. A clue to what we need to do to find out what really happened is in this screengrab just below the highlighted text. Paddock’s brother claimed Stephen paddock “was just a guy” and “just snapped”. And so, if we are to move beyond kindergarten catch-alls in true crime, we have to know more than absolutely nothing about the criminals we’re talking about. We have to know more than absolutely nothing about their motivations about other things in their lives. We have to know more about their situation before they commit crimes. When we do, what we invariably find is that these crimes were accidents waiting to happen. These people didn’t just snap, the terror is that the way they were heading, a holocaust was inevitable. And so I’d like to encourage the regular readers of this blog: Please try to refrain from using those words, it plays into the hands of the criminals without exception. They prosper thanks to our ignorance. We begin on the path to authentic knowledge by admitting the most difficult thing, which is that we know absolutely nothing about these people, let alone their motives. Until we know more, we can’t begin to guess their motives. In the Watts case we have two choices. Either he just snapped and Watts will be an enigma forever and ever, or he planned, plotted, calculated and even fantasized about murdering his family. If it’s the latter then by spending time finding out who he was, and who the Watts family were, who they were as people, what their personalities were like, their back stories and circumstances, only then we will find our way to the key that unlocks the reason for why what happened happened. 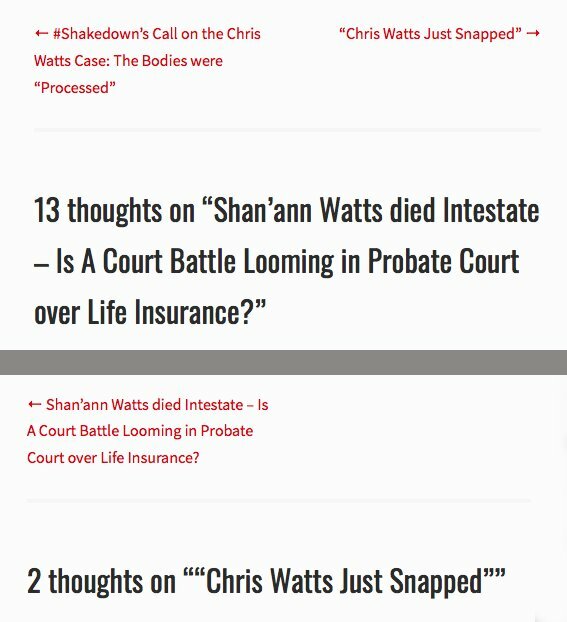 ← Shan’ann Watts died Intestate – Is A Court Battle Looming in Probate Court over Life Insurance? Yes, the words “just snapped” ought to be stripped from our vernacular. One can snap a green bean but can a mind just snap, no such thing. Resentments, ill will, feelings of being shut out, or that we don’t matter are cumulative. Those feelings build alongside how we view our life and how we interpret our experiences. My two questions for others here are 1. did Watts think life would balance itself back to what he wanted – by killing his family. In otherwords, would he be able to return to work, live in his house, and resume his romantic relationship all under a cloud of suspicion of his family “disappearing.” How long did he think he could keep that up? 2. Did he anticipate what an empty house would feel like knowing he was responsible for it being empty as he was premeditating? Are there regrets? Not just Chris Watts either, but do killers of their families anticipate at all the aftermath? What separates the cold blooded from the hot crimes of passion in the moment. And which was Chris? Another way to say this is did he really think he would be better off without his family, knowing he would be responsible for their deaths? Was total annihilation the only solution, for him? He planned the killing weekend, did he not plan how he might feel about it afterward? A word on Stephen Paddock. My favorite body language expert Mandy Bombard, analyzed Stephen Paddock’s brother when he gave his sermon in his driveway. She picked up on some things he said, and how his body moved with what he said that his brother knew something was up with Stephen. Sort through all of the “my brother was a VIP at all of the casinos” and “he helped his whole family” stuff and there is one little kernel in there where he lets something slip. I can’t get back to all of her videos, she keeps getting taken down, but she does have a site where you can join, for pay, which I haven’t yet. It’s bombardsbodylanguage.com. The “Recent Posts” list you put up on the right solves my confusion. My guess is I’m missing pages and pages of your amazing narration and hard work because of this. Again, many thanks for your hard work and your patience. Nick, just now I see for the first time your “Monthly Archive” on the bottom right, all the way down on the right-hand column. I clicked on “October 2018 (6)” and was able to find all of your Oct. posts in sequential order. My confusion is permanently over. Many thanks. Not meaning to be bossy here Piktor but do, please, read Two Face book I. I can tell from this blog there are some smart independent thinkers here, and the Two Face book gives a framework for thinking to take place – and there is book II now so you’ll have to catch up before the train leaves the station and the media tells you what to think. Then if you have time read Slaughter. You will be able to see how the relationship between Nancy and Adam Lanza SHAPED what was to happen at Sandy Hook, also you will feel like you are in a Sam Peckinpaugh movie! It’s intense and it is Nick’s masterpiece. Since they won’t release the autopsy results, here’s a crazy thought – maybe the kids died from eating something at the party on Sunday. They were known to have health issues and allergies. Dad put them to bed early and went about his business. Perhaps during the evening they had a reaction and stopped breathing or choked on their vomit. Mom came home and found them dead or unresponsive and started shaking them. Dad thought she was harming them and attacked her. I know it’s horrific what he did with the bodies, but panic (sudden uncontrollable fear or anxiety, that prevents reasonable thought and action and often causing wildly unthinking behavior) can make you do the inconceivable. Just finished watching the first episode of the Netflix series “A killer in the family”. A renowned criminal psychologist is profiling a family annihilator and there are many similarities with CW. Many red flags in retrospect. Maybe he was on drugs? Acid? Assuming that someone might have “snapped” does not necessarily mean that one doesn’t believe there to have been a build-up or a back story to it all. It also doesn’t mean they aren’t seen as a monster. This is why a lot of people are choosing to stay open-minded until all the facts are laid bare. I’m going to assume that CW was mentally evaluated, but maybe not since he did not go to trial, however he would need to be mentally competent to take a plea deal, right? I would think and hope that when a crime to this extent occurs, a mental evaluation would be at the top of the list. Of course, I think CW should rot miserably in prison, but don’t we want to try and learn what, if any triggers may have driven him to such a horrendous act? I’m really into researching the WHY and HOW. Trying to understand the psycho analysis of such violence against a family. It’s not just an affair that causes someone to rid of their family. Is CW just not mentally strong enough to handle the stress that can come with normal parts of life (e.g., family feuds, money problems, spousal issues)? Was this premeditated? CW was arrested within days. Cops were at his house the day of the disposal of his poor family. I just can’t fathom any of it.